Crockpot Cheesy Broccoli Rice Casserole–the casserole from your childhood that’s made easy in the slow cooker! 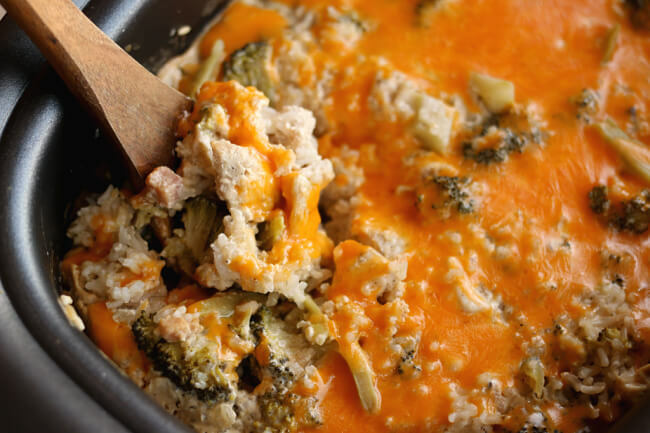 Creamy rice, broccoli florets, sharp cheddar cheese and your choice of either chicken or ham are combined to make a perfect side dish or main dish. This is the casserole from your childhood but it’s made sooooo much easier. When I was young my mom would make a version of this casserole in the oven. She would have to cook the rice and the chicken beforehand and then combine everything into a pan and bake it. 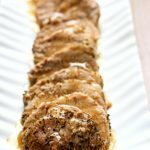 This version of the recipe is awesome because you throw the uncooked rice and uncooked chicken in the crockpot and it all cooks together in a couple of hours. One thing I’ve noticed is that there are a lot of internet searches on my website for broccoli casserole on Thanksgiving. Although I haven’t noticed a broccoli casserole at my Thanksgiving dinner table, I’m guessing many of you do use broccoli casserole as a side dish to your Thanksgiving dinner. 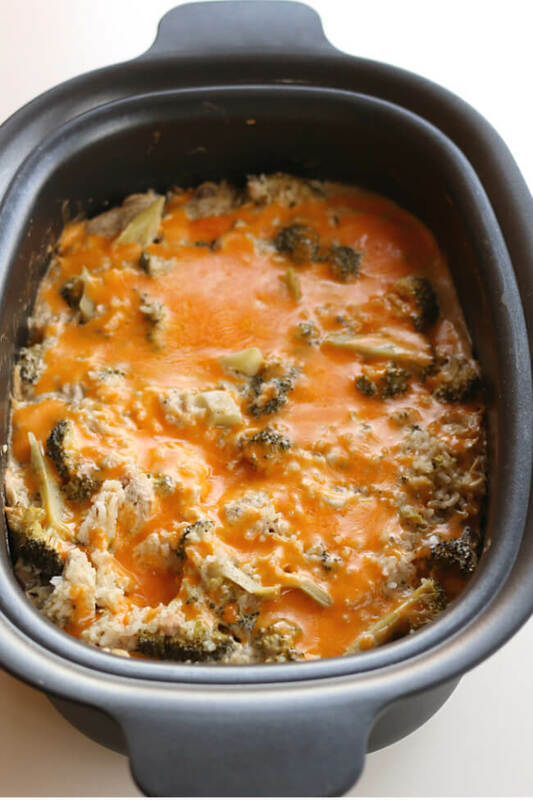 So if you’re in charge of the broccoli casserole this year for Thanksgiving and you need the oven space for other dishes USE your slow cooker and make this one! This crockpot broccoli rice casserole serves a lot of people if you use it as a side dish and it tastes great! I used chicken when I made this casserole but you could also use cubes of ham. If you want you can leave out meat and add in more broccoli. 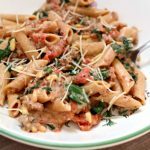 It’s really a versatile casserole that you can add and delete items pretty seamlessly. My casserole took about 2 hours to cook. However remember that all slow cookers cook differently and some will cook hotter than others. Just keep your eye on it. I am guessing at the fastest your casserole will cook in 90 minutes and at the most 3 hours. 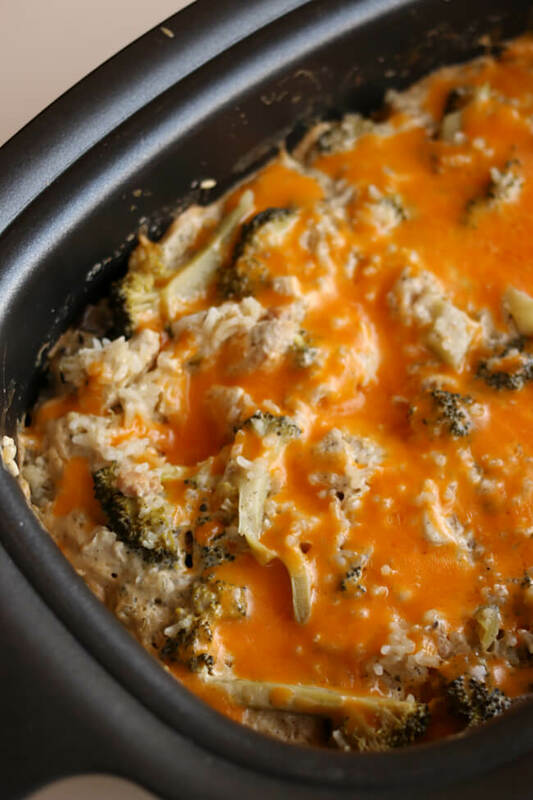 Note: if you want a broccoli casserole recipe that doesn’t use cream of soups, is gluten free and uses brown rice try this Slow Cooker Cheesy Chicken, Broccoli and Rice Casserole. 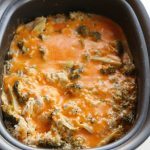 To make Crockpot Cheesy Broccoli Rice Casserole this recipe I used my Ninja Auto-iQ 6 Quart Slow Cooker. * My favorite feature of this slow cooker is that it has a stovetop function. This is perfect for sauteing or browning before you slow cook. 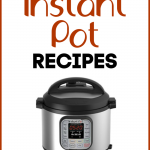 This slow cooker has four manual cooking functions: slow cook, stove top sear/Saute, steam, and bake. The casserole from your childhood that’s made easy in the slow cooker! 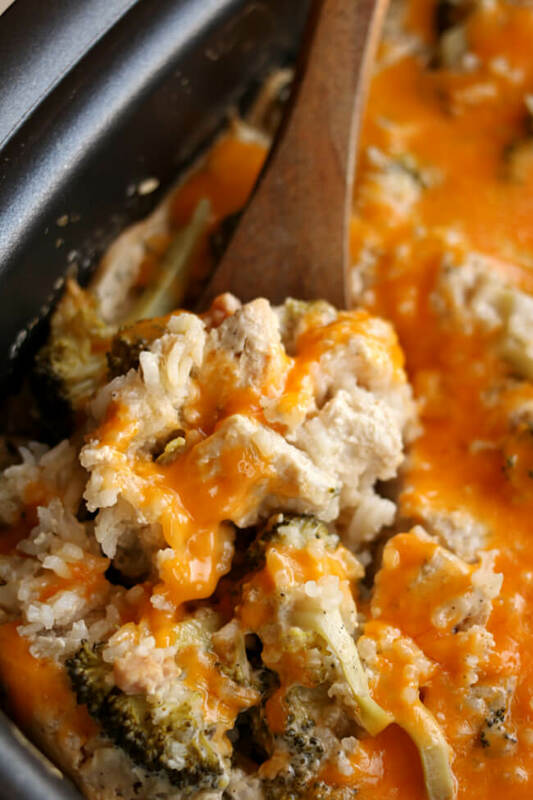 Creamy rice, broccoli florets, sharp cheddar cheese and your choice of either chicken or ham are combined to make a perfect side dish or main dish. Bring the chicken broth to a boil in a pot on the stove. Once the chicken broth is boiling add in the broccoli and let it cook for 3 minutes. Then pour the broth and broccoli into the slow cooker. Stir in the rice, chicken/ham, cream of chicken, cream of mushroom, evaporated milk, garlic salt, pepper and half of the grated cheese. Sprinkle the rest of the cheese on top and let it melt. Scoop the casserole onto plates and enjoy! I used my Ninja Auto-iQ 6 Quart Slow Cooker. * My favorite feature of this slow cooker is that it has a stovetop function. So for step one I used the stovetop feature to bring the broth to a boil. 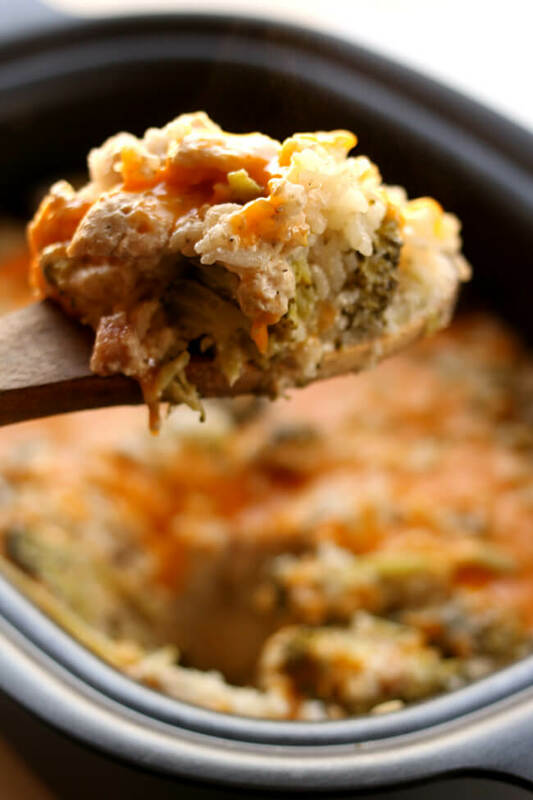 Like this recipe for Crockpot Cheesy Broccoli Rice Casserole? Get all my new recipes delivered to your email inbox by signing up below. Have you ever doubled the receipt and made it in the crockpot? No I haven’t tried that. I bet it would work. I would increase the cooking time a little. What temp and time for oven? I don’t know for sure. I’ve never made it in the oven. I would suspect 350 for an hour. Do u use raw chicken or cook chicken first. I made this today and it was not a good outcome. The rice did not cook all the way through and it wound up being a really bad consistency of gushy and crunchy. If i had to do it again in the crockpot, I would cook the rice on the stove beforehand and set it aside. I did not have a fancy crockpot, either, so much harder to control the temperature. All in all, I think the traditional way of doing this recipe is the most reliable. You’re probably right. 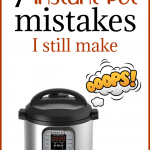 All slow cookers cook so differently sometimes it’s a challenge to write a slow cooker recipe because I am not sure how it will turn out for others. For me it was perfect for you it was not. Sad day! What brand(s) or soup come in 13.75 Oz cans? I couldn’t find any, so i went with standard 10.5 Oz, and added more broth. Then it seemed too liquidy, so I added more rice. I maybe added too much, but everyone (Husband and Mom) agreed a little sticky was better than too liquidy. Disclaimer: I’m pregnant, so shopping and cooking cause me lots of anxiety. This is WAY better than a cheesy chicken and broccoli rice casserole I made in the oven a few months back. Hi Sarah, thanks for letting me know about the size of cans. For some reason I wrote it out wrong. The size I used were indeed the 10.5 ounce size. I have corrected the recipe to reflect the corrects amounts. I would love if your recipes would show how many the dish would feed. Am loving the crock-pot recipes as I’m not brave enough to use my one cook pot or pressure cooker as I would call it. At 82 not the gourmet cook and like to keep it simple. Hi Corry, I try to indicated how many it would feed in the top of the recipe. This one says yields 10 servings. Hope this helps! 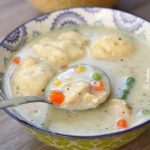 Karen, this looks uber comfort food-a-licious! Unfortunately, our slow cooker croaked. We have limited kitchen space, so when we chose to “replace” it, the multi-tasking powers of the Instant Pot won. 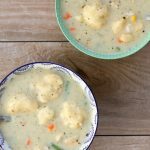 It won’t LOOK the same as the pretty product from your classic wide surface slow cooker, but do you think I might still manage good cooked results with this recipe in my 6 quart Instant Pot, using the slow cook function? Here is a casserole pressure cooker recipe.